1. Akampene also called Punishment Island. The significant aspect of this Island is that the Bakiga locals used to leave unmarried pregnant girls on this small island with a lone tree so that they could die of hunger or while trying to swim to the mainland (swimming skills were rare). The purpose of the act was to educate the rest of the young girls and also show them practical example of what would happen to anyone who could become pregnant before marriage. To young man who had no cows to pay for the bride wealth, the Island was strategic place he could pick up a girl left to die in the Island. However the back ward practice was abandoned in the first half of the 20th century. Although this practice has been abandoned, it is still possible to find women who were picked up from Punishment Island today and these give authentic stories of what could happen in the Island. This Island is the home of Lake Bunyonyi Development Company, an organization with strong links to Church of Uganda which is the dominant church of the lake area. They use tourism to generate funds for several development projects around Bunyonyi. The island has many luxury tents, chalets, and also campsites for tourists to stay on. It is also possible to rent out canoes and sailboats with a view to paddling to one of the other islands. The striking feature of the island is its forest, a demonstration of the most appealing attribute of the eucalyptus tree characterized with an exceptionally fast growth rate. The hills around Bunyonyi used to feature many forests but overpopulation led to them being cut down to create land for agriculture needs. Eucalypti have been imported to improve the situation. But eucalyptus plants may also have a negative effect such as soaking everything useful in the soil, leaving it more or less barren. Kyahugye Island covers an area which is approximately 30ha (74 acres) in size and also the nearest to the mainland which is just a mere 5-minute boat ride away. It is surrounded by a 1-2m (3-6.5 ft.) wide strip of reeds interspersed with papyrus. The Island has many tree species including Eucalyptus species as well as the Pinus species, and Species Alnus plus Cuprssus species and all these tree species form a wide perimeter around the Island. The vegetation on the Island is mainly divided into four types namely bush, open fallows, tree plantations and natural vegetation. The hilltop of the Island is flat and has been developed for tourists. There are chalets and campsites for accommodation, and a well-stocked bar and restaurant. From the top of the Island, there are spectacular views of the surrounding terraced hillsides, the calm waters of Lake Bunyonyi, and the neighboring Islands. On a clear day, Mt. Muhabura can be seen in the distance. Tourist activities like Dugout Canoe Treks, Nature walks, Mountain Climbing, Birding walks, Community visits, etc. can be organized for the tourists to experience. 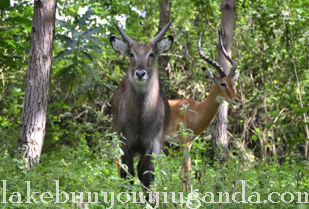 It is the only Island with wild animals which include the Impalas, Zebra, Water bucks, the Kobs and the only Debrasa Monkey. It also housed Lake Bunyonyi Eco Resort. 4. Bwama and Njuyeera (Sharp's Island). The buildings of the hospital are now used by a boarding secondary school which attracts students from the entire region. There is also a primary school but no village on the island. 5. Bucuranuka or Upside Down Island. The legend expressed it that this Island killed many people. About twenty were once brewing local sorghum beer there. An old woman was passing by and she said: "Can you give me some local beer?" They wrongly thought that she was a beggar they knew. They refused her: "Get lost, beggar! Get lost!" The old woman asked: "So you will not even give me a sip? Can I at least get somebody to take me to the mainland?" They answered: "Yes, because we are fed up with you!" They chose a young guy to take her over. When they reached the shore and the guy was just beginning to return, the island turned upside down. All died, only a chicken flew away and survived. As it stands as the place of little birds, Lake Bunyonyi features over 200 species of birds among which include; weaver birds, grey crowned crane and herons. The Nyombi swamp is a home to a range of the bird species in the area. 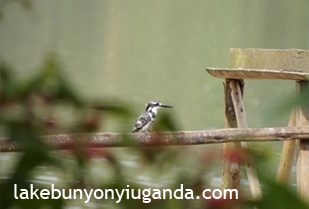 The International Migratory birds can also make it to Lake Bunyonyi in periods of winter. Literally translated as the place of little birds, Lake Bunyonyi is 1,962m above sea level stretching to 25km in length and 7km in width while the depth is anticipated to be in between 44m and 900m and if proved correct, the lake would stand as the second deepest on the African continent. Noted to be Bilharzia free, Lake Bunyonyi has been a darling to many who find it easy to swim in its natural waters though very discouraged because of its depth. 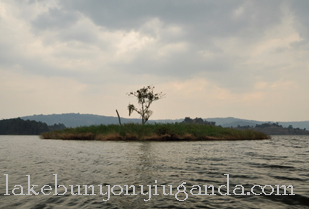 Lake Bunyonyi is remarkably known for its range of 29 Islands some of which are not inhabited. The adjoining hills of Kigezi also present a magnificent adjoining landscape. The lake features rich history including the introduction of fish around 1930s though they massively died during the 1960s due to shallow mixing resulting from wind. The lake now features species like cray fish, Mud fish and Mirrow carp. 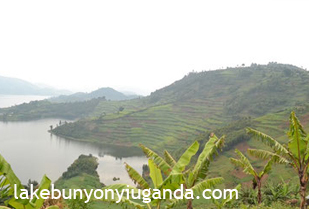 The Islands of Lake Bunyonyi and the close lake surroundings feature settlement of two tribes – the Bakiga and Batwa. The Batwa people were introduced to the area following their eviction from the forests of Bwindi, Echuya and Mgahinga. The Batwa people are indigenous inhabitants of Uganda and their heritage is rich and worth exploring. Though they were evicted from their homes – forests, the Batwa still posses the last of their fading culture. Their music dance and drama will definitely mesmerise whoever attempts to incorporate them in his/ her Uganda safari tour package or draw the same into the sorrowful imagination of how their tradition is steadily fading away. The Bakiga are part of the Bantu group that have tilled the hills of Kigezi for centuries past. They are popularly known for their strength and unmatchable hard work when it comes to cultivation. They have rich traditions too which are worth exploring. Their energetic dance is impressive while their ancient stories on how the pregnant girls would be dumped on the Punishment Island and left to die will open you to understanding their extreme wrath. Lake Bunyonyi is enclosed by magnificent green hills of Kigezi with terraces rising to a height of 2,200 – 2,478m. The range of 29 Islands straddle across the waters of this beautiful lake form one of the great sightseeing admirations that one can ever encounter. The beautiful sight appears fresh for the great part of the day due to abrupt weather changes and along with the direction of the sun. The morning presents beautiful mist covering the myriad of Islands while the afternoon is marked by the warm tropical sun cover. The dim sky appears as the evening draws close. At times, the clouds can soak the entire Islands out of sight. The view of Lake Bunyonyi is perfectly explored from the panoramic hill which shelters Arcadia Lodge. A meal or a drink at the terrace overlooking Lake Bunyonyi offers a lifetime memory that is worth exploring while on safari in Uganda.